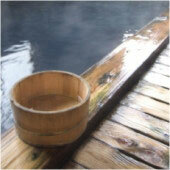 When designing a Japanese bathroom, the designer consciously looks for balance and harmony, simplicity and tranquility. Japanese design adopts a minimalist approach where less is infinitely more. There is nothing bland about this design style though. Rice paper screens next to silk cushions. No wonder so many westerners explore this design style for their bathrooms: to start the day with a sense of serenity or to restore the senses after a long day of bustling. Japanese interiors are known for their use of neutral and natural colors, such as rice paper, black frames, bamboo and wicker. Bright red may be used as accent color in lanterns, cushions or lacquered ornaments. This does not mean that you cannot use other bright or strong colors in your design. It rather means that too many such colors in the room should be avoided and should be used sparingly to create a focal area. 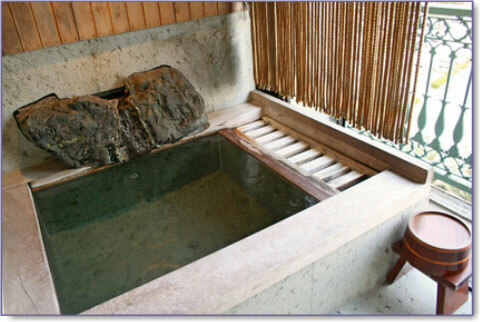 Most often the focal point of the Japanese wet room is the ofuro - the deep soaking tub. 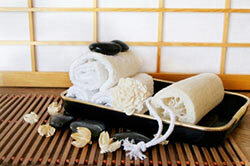 Our page on Japanese Bathroom Design takes a closer look at Japanese bath tubs. The surroundings play an important role too and this is the one design style where an abundance of decorative elements and ornaments are not welcome. A single high quality item will be so much more effective than quantity - great news for the budget! Wall decoration - and the absence of any decoration on the walls - must be carefully considered. A unique work of art on a single wall can be hugely effective, but if all the walls are decorated, it may create a sense of clutter. 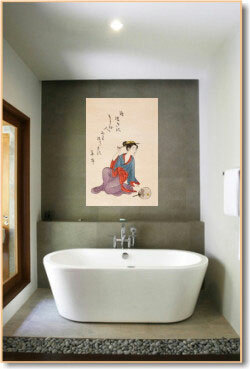 You could use recognizable Japanese images for your wall art and to re-enforce your Asian bathroom design, e.g. calligraphy, bamboo patterns etc. However, if you embrace the principles of Japanese bathroom design, i.e. simplicity, harmony etc. you do not need to overtly display all things Japanese. Rather, your wall art should be simple, stylized (in whatever subject matter you choose) and almost graphical in execution. Pebbles ranging from white to slate are reminiscent of Zen gardens. 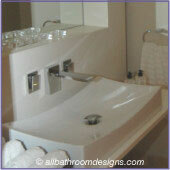 They can be used to nestle a vessel sink or as detail around a tub. Note: they are not scattered randomly but used within determined spaces and add a beautiful natural element to your Japanese Bathroom. The shoji screen is a feature instantly associated with Japanese architecture. In a small bathroom it can be used as window treatment, or as a dividing wall to steal light from an adjoining room, if the bathroom has no window. Take a look at our Small Bathroom Ideas for an illustration of this. 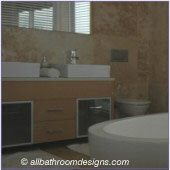 In a bigger bathroom a shoji screen can be used to partition a bathroom for added privacy, e.g. the toilet area. The screen pattern can be carried through on your skylight design, shower surround and as decorative design on the glass doors of storage units. You could even use it as lighting feature on your floor! Design Tip: Richly textured rice paper sandwiched between acrylic sheets offers total privacy and is a lovely modern interpretation of the screen. Manufacture your pocket door to resemble a screen. If an element works beautifully, e.g. an exquisitely carved lacquer box in a niche or on a glass shelf, resist the urge to repeat it elsewhere. It will lose its impact. Don't use a varied color scheme throughout the room. You can use all those colors in a single item though, e.g. silk cushions or a kimono on display. The overall effect should be that of harmony - emphasized through that single burst of color. Don't repeat a color that's used as a focal point in other elements dotted about. This will cause the eye to jump from one colored element to the next, rather than calmly scanning the scene and being drawn to that most important focal point. There should be a sense of order to create a truly serene space. Storage becomes an important design consideration to keep clutter to a minimum. 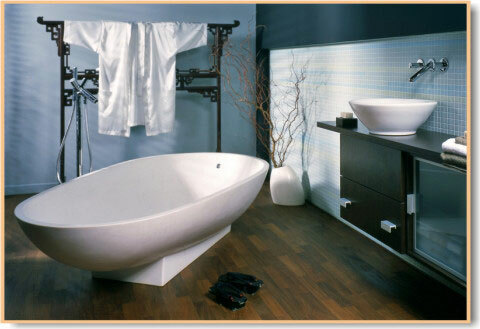 A contemporary bathroom with a minimalist approach gets just a touch of a Japanese bathroom feel - a beautiful match. With a canvas like this, it is easy to change your bathroom theme from time to time.